S. Bhattacharya, Kumar, A. , Kaushal, V. , and Singh, A. , “Applications of m-Health and e-Health in Public Health Sector: The Challenges and Opportunities”, International Journal of Medicine and Public Health, vol. 8, no. 2, pp. 56-57, 2018. 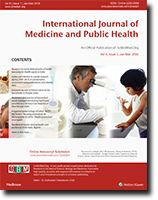 M. Sharma, Bhattacharya, S. , and Singh, A. , “Child Sexual Abuse and the Role of Health Promotion in India: An Analysis of a Case Study”, International Journal of Medicine and Public Health, vol. 8, no. 4, pp. 163-166, 2018. M. Abu Bashar, Bhattacharya, S. , and Singh, A. , “Unsafe Abortions in India: Removing the Bottlenecks”, International Journal of Medicine and Public Health, vol. 8, no. 1, pp. 42-44, 2018.